CineWinds PRO is the expansion to the next-generation orchestral CineWinds CORE library. 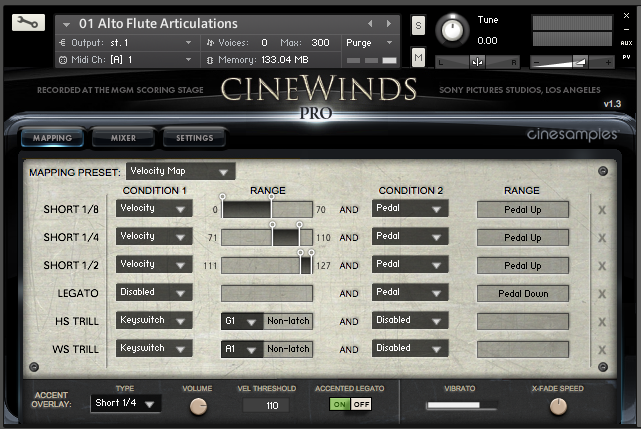 CineWinds PRO expansion fills out the remainder of the orchestral woodwind section, and also offers an eclectic choice of ethnic, Renaissance, and period wind instruments most often used in film scoring. As with CineWinds CORE, we assembled a team of the finest musicians and crew — we found great comfort and amazing sounds at the SONY Scoring Stage, recorded and mixed by the unparalleled engineer Dennis Sands. The woodwinds in CineWinds PRO are covered with the same depth and nuance as the instruments in CineWinds CORE, and William Lyons gives us a series of ethnic woodwinds of such expressiveness and detail rarely heard in orchestral sample libraries. The PRO expansion features twice the content of the CORE library, and we hope you enjoy every bit of it. What's New in the CineWinds PRO 1.3 Update? Cinesamples applied its Adaptive Legato Engine from CineStrings SOLO, Tina Guo Acoustic Cello Legato, and Viola da Gamba to the orchestral instruments in CineWinds PRO. It allows you to tailor the legato response to your own playing style, and is designed to respond musically to your performance. The engine detects your playing speed and intelligently adjusts the interval speed to match. This means you can play slow, expressive lines and fast runs in a single performance, without touching the speed dial. Additionally, the intensity parameter responds to velocity. CineWinds PRO includes a brand new mapping area styled after CineStrings SOLO that allows for greater flexibility in customizing composer workflows. The new Ensemble Patch includes the Alto Flute, English Horn, Bass Clarinet, and Contrabassoon. What's New in the CineWinds PRO 1.2 Update? CineWinds PRO is comprised of entirely new orchestral woodwind sample content, and as with CineWinds CORE, it was proudly recorded at the SONY Scoring Stage and mixed by Dennis Sands. CineWinds CORE contains the standard orchestral woodwinds — piccolo, flute, oboe, clarinet, and bassoon. For CineWinds PRO, we went beyond the essentials to bring you exceptional instruments, such as the alto flute and contrabassoon, as well as a comprehensive selection of ethnic woodwind instruments, performed by expert William Lyons, who sampled the exact instruments he played in many film scores, including The Hobbit by director Peter Jackson. 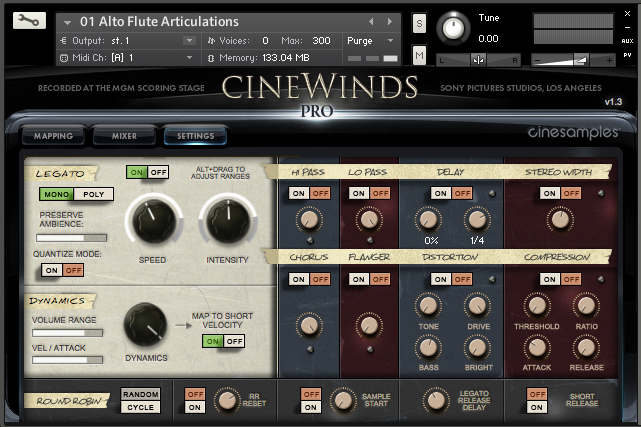 CineWinds PRO does not require you to purchase any additional sample playback software, and is licensed to work with the Native Instrument’s free Kontakt Player. Explore the latest version of Kontakt HERE. All you need is a sequencer like Logic, Cubase, Digital Performer, LIVE, or Pro Tools, and you’ll be up and running. WHAT DOES CINEWINDS PRO COME WITH?